This was originally just going to be a watery type effect but I got carried away elaborating it, so it actually became a little play toy in its own right. 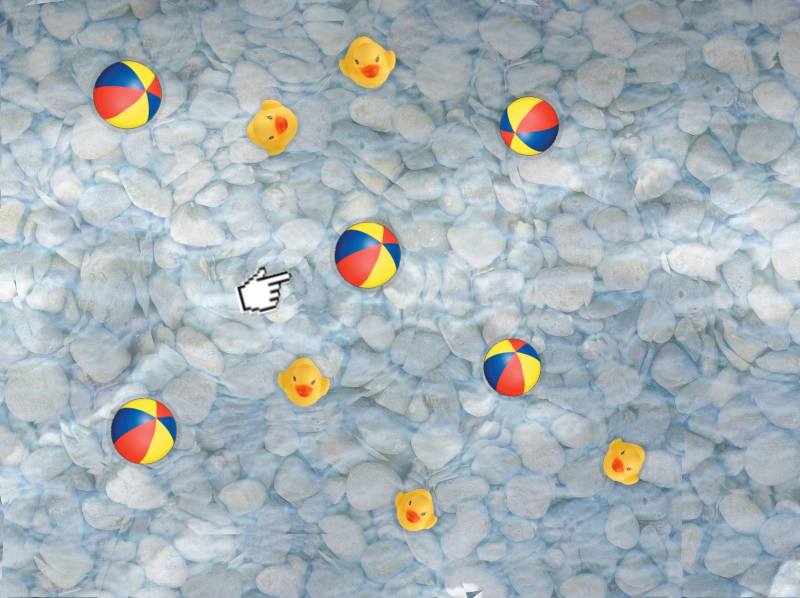 Basically, it's a little pool full of rubber ducks and beach balls, that you can splash around in and interact with the objects as they float around. The water effect looks really nice, you have to see it in motion as a screenshot does not do it justice. The physics are pretty good (no where near perfect), though there's no superposition of waves, which is the main problem. Edited by OpticalLiam, 01 July 2007 - 12:41 PM. It was quite nice but the it seemed a bit hard to control. The cursor span in a strange way which really threw me off. And the toys seem to be going everywhere. As you said the water effect is OKAY but it is just a bunch of ripples, is expecting more of a wave effect rather than just ripples. Just looking from the screenshots. Why are the shadows on the water like that? That's what's throwing me off. Awesome, especially the part where you push the duck. Seriously though, great job on the effects. Don't worry about the cursor, it just moves like a normal one, but it likes to point at stuff. Yea the toys do move a bit too much, you can just increase the friction in the toy object to stop that. Yea, I think the reason it isn't entirely convincing is the lack of superposition of waves. Which is pretty impossible to do using just ripples like this. Maybe the water is really shallow and shadows are being casted on the floor, who knows, it just looks nicer. Yea man, pushing those ducks around the pool is pretty fun. Sure, I just updated this, DOF and TFS with working mirrors! I think it does look un-realistic because water does magnify objects but 1)maybe a little less...and 2) kinda from underneath. Heh, I explained badly but anyhow it's still very well done. This is pretty nice! The physics are smooth, and its kind of fun to play around with. Maybe you could make an actual game with these physics, maybe with living swimming creatures, or something. Well you could try clicking the mirror that says [Working]... you know, just sayin'. Seriously though if you meant the EXE version, you're right I didn't upload that to a working host again. I will do if you want it though. Edited by OpticalLiam, 01 July 2007 - 09:35 PM. Edited by wilyumi, 01 July 2007 - 09:47 PM. maby you could add fish too? I use devC++ to make games and im waiting to get uv mapper pro. The ripples didnt seem very round, they looked kind of squared off. You only have 10 edges per ripple, but i changed it to 40, and it was perfect. It did cause a bit of lag, but it was virtually unnoticable. It is great, either way! That, my friend, was freaking awesome. I have to think of some way to use this in a game now. I'm currently updating this effect to work in 3D, it's coming along really well, will post screenshots later. I'm aware this is a semi-necro-bump, but its in good cause.